One of my best friends is a delightful woman I have known for well over 25 years now. Marla recently retired and began writing her interesting and well written blog. She challenged me to write some blogs with famous quotes on her post on Explorations In Place. Thank you Marla, for this fun and rather different challenge. Sew happy everyone. Tomorrow I will share another quote and tap another victim, um, I mean blogger friend. 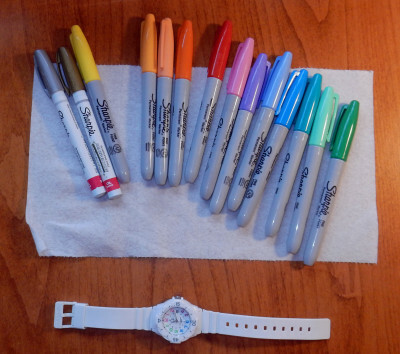 The cheap white plastic watch ready to ink. I leave tomorrow for the Mid-Atlantic Quilt Festival in Hampton, VA and a visit with my family members there. I’m very excited. It looks like the weather is going to cooperate and the trip is all happily arranged. So in the way of things, the battery died in my beautiful Bolova watch and I really didn’t have time to take it to a jewelry and get it changed (I can’t do that one myself) before I went. So I ordered this cheap white plastic watch with one-day delivery for about the same a battery would cost. And yes, I will still get the Bolova fixed, but I also wanted a watch to wear when I am working with paints and dyes, etc. After…It was hard to keep any kind of straightness, so I ended up doing wandering colors. It is seemingly dry now. I’m going to let it continue to dry for another hour or so before putting it on. It may wear off as I wear it, but just passing a cloth over it, there is no change of color or stain on the cloth. After that dried I painted over it with clear finger nail polish. We’ll see how this wears. The fun thing is the numbers on the watch face are all different colors kind of like a color wheel, so it fits the project. Sew I’m off to my neice’s first thing in the morning, and on to MAQF on Friday and Saturday, home Sunday. How fun is that?! Tags: How fun is this!, I love comments., MAQF, Other craft projects, What in the world is BJ doing! I just sold Waiting… yesterday. It has been hanging in G Street Fabrics Bernina section for about a month now, along with a couple of my other quilts I have decided to sell. I love this quilt. It took me over a year to make (off and on…probably about six months full time). I sent it through several national shows, and used it a bit for my show and tell trunk shows, but the judges thought the borders were too wide and so forth. I actually agree with them now, but I will tell you that feedback to me personally from people who have seen it was the most positive of any quilt I have made before or since. 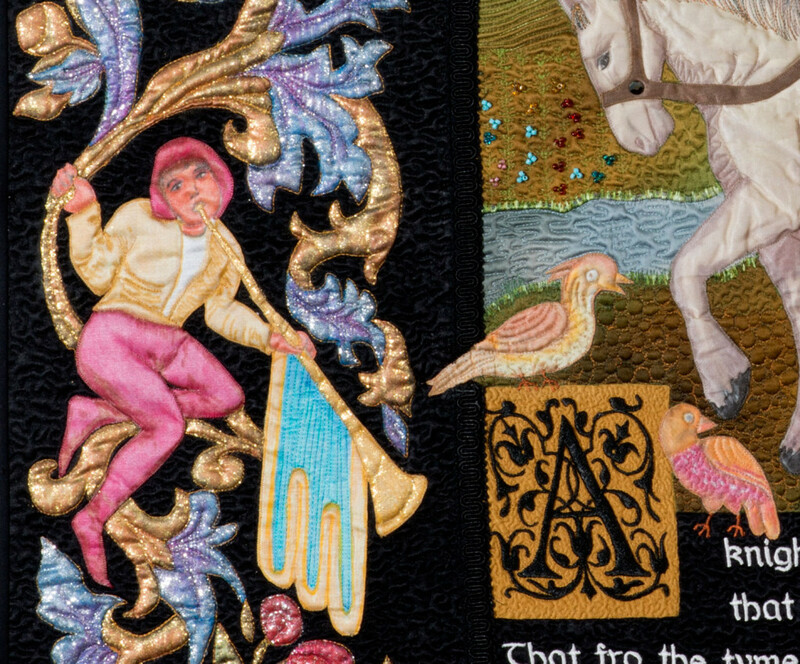 Several people–even men–have actually wept over the quilt, as did the buyer. The one-on-one responses have been so strong that I decided to make a whole series of quilts based on the heart-tugging circumstance of women (and some children) waiting at home for their men to return from war or other dangerous and totally necessary jobs down through history. The women faced difficult and sometimes dangerous lives while their husbands were gone, and many kept the home going, raised their children, and fed their families while their husbands went and came back from their important jobs. Or they did not come back! Currently, I am working on the second in the series. This will be very similar to the one above, except the borders are different, or non -existent, and the woman is a little better dressed and has her daughter with her. The ship is going to be better also, I hope, and there will be a distant light house. I have been working hard to get the sky and sea fabrics right, and I think I have finally done that, so I am constructing the top and trying to come up with a name. 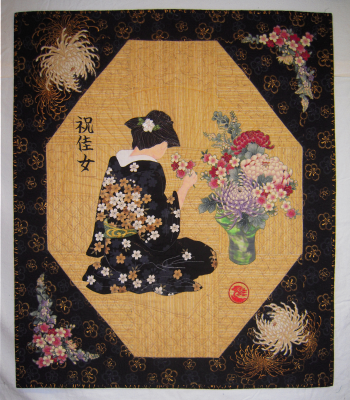 It is hard for me to sell my quilts. I put a lot of myself into them. But it is also an honor when someone loves one so much that they buy it. I am so happy it is going to a couple who love it and told me personally they are planning to cherish it and pass it down to their family. I need the money, I need the space in my home for more quilts, and I need to sell more quilts for these reasons. Sew happy, everyone! Go make yourself some art for your walls. By the way, I haven’t forgotten the idea of a quilt work-along that I advanced some weeks back. I’m working on the pattern now. Also, I am working on samples for my first book. The other day I was cleaning! Yes, I do that occasionally, but not often enough. 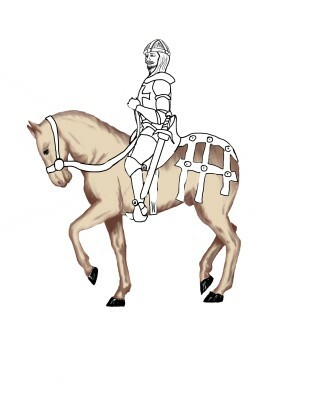 Anyway, I found this…my original design for Canterbury Knight. This quilt will be on display at Mid-Atlantic Quilt Festival from 25-28 February and I’ll be down there hanging around it from time to time on the 26th and 27th. Oh my golly! That’s just a week and a half away! Sew this is how I usually design a quilt. I start with a concept that drops into my head. in order not to lose the idea, I often make this kind of silly quick sketch with just a few notes. Then I go to my computer where I have several pieces of design software and work the concept into a full design. I used to do this on paper with pencil, so if you don’t have design software, you can still do this yourself. Here are a few of the many many files I have in my steps toward the full design. 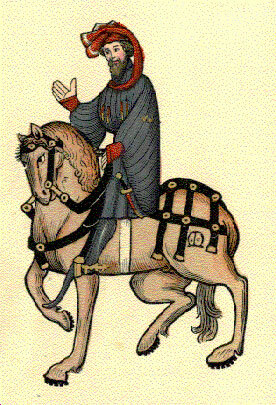 One of the original 12th century drawings of Chaucer’s knight. I only kept the concept for the horse’s armor. My horse drawing all painted and ready to print onto the silk fabric. 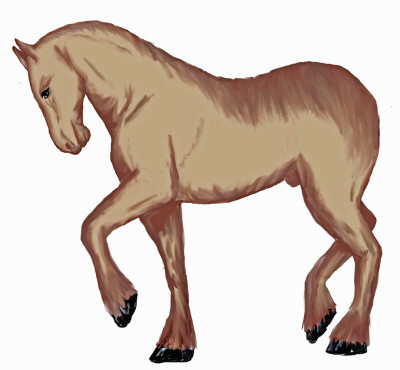 This horse took me days to draw and paint using my design software. I need to get faster. I draw the pattern for the appliques and place them so I can see they work right. I hand painted the knight’s head and hand, the rest is applique made from metallic-like fabrics. 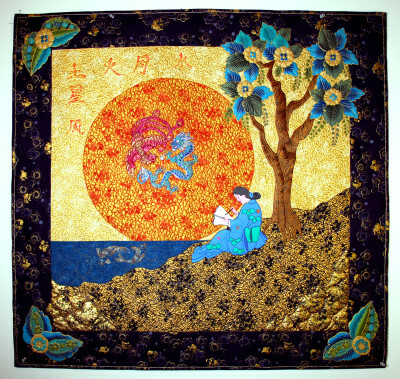 I do a lot of research for some of my quilts, such as these ancient manuscript quilts. 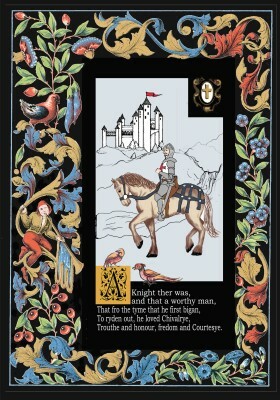 Sometimes I’m lucky enough to find what I want in Dover publications. Sometimes, I have them hanging around my house (my late husband was a magnificent librarian and book collector and I have a lot of his collection). Sometimes I have to go elsewhere (always being conscious of copyright issues). In this case, I found the border in two different sources–Dover Illuminated Manuscripts and a book my husband had of ancient illuminated manuscripts. it’s quite similar, but I made a lot of changes too. Afterall, I am not trying to reproduce the ancient manuscript, but am making an ancient manuscript “inspired” 21st century piece of art. This gives me the option to change things I don’t like or want to make. In this case, I kept fairly close to the original. I changed the announcer boy a lot, removed some of the busy-ness, adjusted for size, and changed the background to black. Then I took the designer boy, the “angry bird” on the left and the two big flowers and turned them into appliques that I hand inked onto silk. The rest I traced onto my black border, quilted, and then painted it. 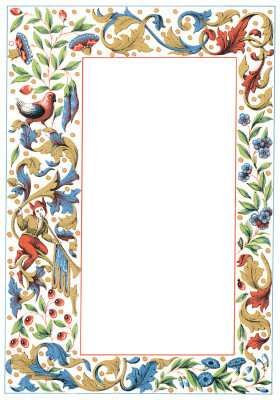 I digitized the verse in Bernina V7 software, and found birds to add around the text box. I also added the little upper right box to balance the letter “A”. Eventually, one piece at a time, I arrive at the full design so I can begin making the appliques and quilt top. I use Corel Draw to turn this into a full sized print out. Corel Draw easily tiles the print into whatever sized paper that will fit through my printer. In this case I used tabloid sized paper (11 x 17) to minimize the number of tiles. I then tape them together. Getting to this point is about one-third of the time it takes me to make a quilt. This is the design file I worked with and enlarged to full size. I started this quilt in December 2014 and “completed” it in March 2015 in full-time work. After it went to The HMQS and I got back some helpful criticism from the excellent 2 judges, I did a fair amount of revamping and correcting. In fact, this quilt has had something “fixed” on it after every show. I even darkened and re-inked some of the colors that you see in this photo before sending it to the Mid-Atlantic to help overcome the judges viewpoints that the border overwhelmed the central theme. I do note though, that ancient manuscript borders often “overwhelm” the central theme, if you look at it that way. Anyway, a quilt is never done until it’s done. And I learn something with every quilt and every show. So if you are going to MAQF this year, drop by and see this quilt. I also have “Kanazawa Memories” in the show that I’d like you to see, but that’s another design story altogether. I may be there by one or the other on Friday or Saturday and I’d love to see you. Make sure to tell me who you are. Sew happy everyone! 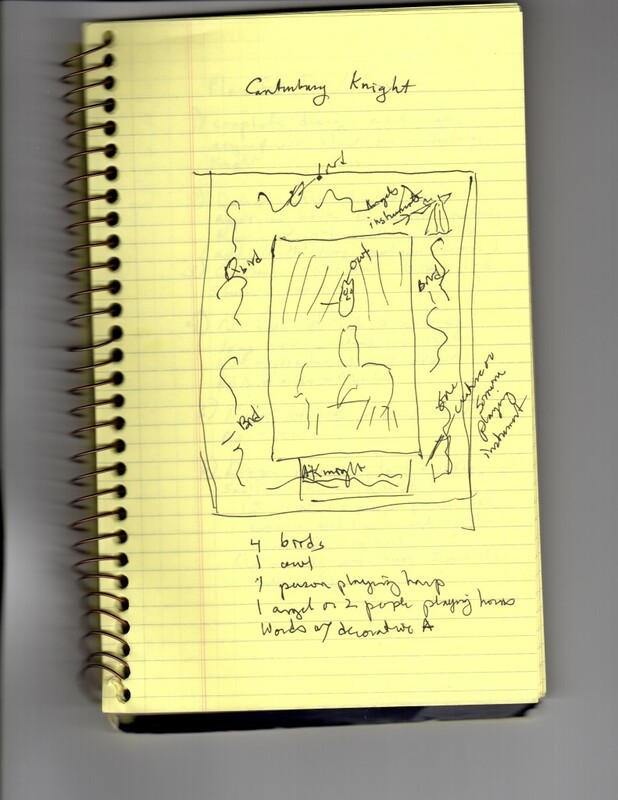 Design your own piece of art…start simple and go forward from there. Make changes as desired. Note: I have added a “Donate” button that goes safely through Pay Pal. I do not want anyone to feel they must donate, nor guilt trip anyone. I note I am a struggling artist, and I thought you may want to drop an artistic donation in for fun and to help keep the blog running. PLEASE, continue to read and comment if you don’t wish to donate and DO NOT feel guilty if you don’t. I really struggled with myself trying to decide to add the donate button. But in the end, decided to try it. Cheers. 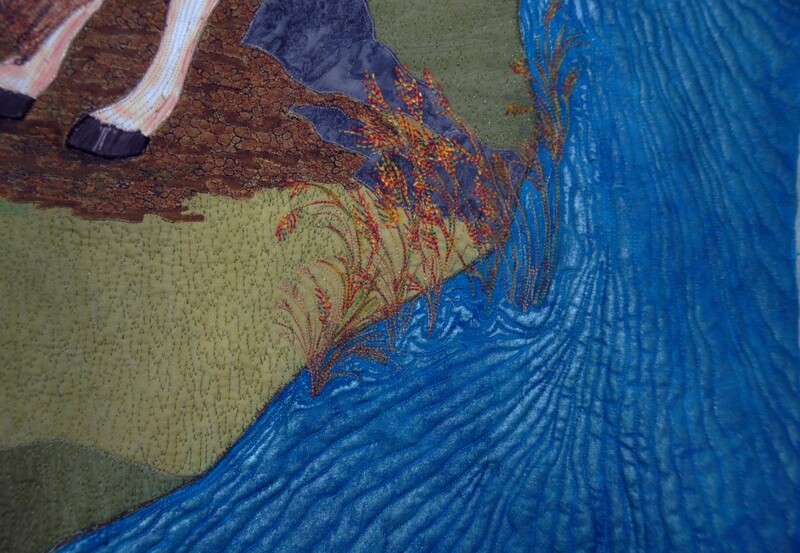 When I first began to quilt in 2004, painting on quilts was not as common as it is today. Now when you go to a show many of the quilts, even traditional quilts, may have touches of paints or be whole cloth quilts with paints. 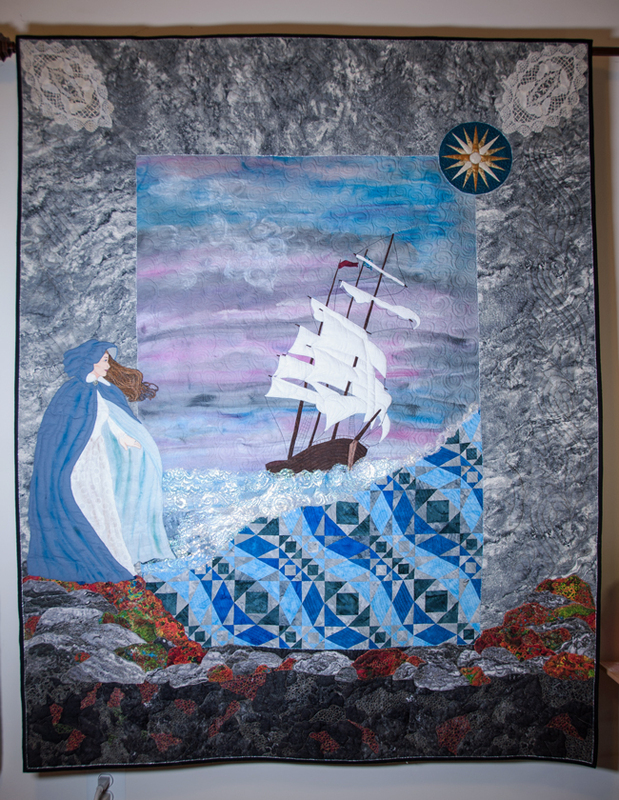 At that time, I somewhat arrogantly thought I would never use paint on any of my quilts, but over time I realized a little bit of paint can make a really big difference in the outcome of the pictorial quilts I like to make. Over the past few years I have used paints on most of my quilts, even if it is only to add high or low lights. I think it was Sharon Schamber’s Quilt Fairy video class that convinced me to try using some paints. So once I started using them, I discovered that the many types of paints, dyes, and inks for fabric painting all have different results. These differing results can at once be confusing and useful for the fabric artist. I am constantly learning on this topic, and in no way consider myself a true expert, but thought I’d share what I have found useful for my own stash that I have collected over the years. There are a lot of them out there and I certainly haven’t tried them all, but these are in my stash and give me a pretty complete coverage of things I want to do with my own fabric art. Shiva Oil Paint Sticks: These are particularly nice for adding shading, highlighting and lowlighting on cotton quilts and for making well-blended coloration. Once heat set they are washable. I don’t know how often you could wash it, but at least twice (I used cold water and woolite), and that’s enough to get the quilt made and properly blocked. River flow highlighted by Shiva Oil Sticks. Faber-Castell Pitt Artist Pens: I use these frequently for many purposes. I wrote to the company and they do not claim these are for fabrics, but I have found them successfully remaining on both prepared for dye cotton and silk after heat setting through one cold water wash with Woolite. I have not tried more than that, but that is sufficient to remove markings and block a quilt. 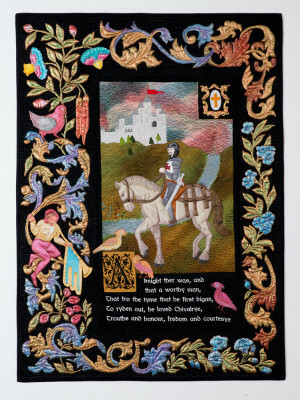 I used them to color silk appliques for Canterbury Knight, cover small imperfections in thread work, and add depth to thread paintings. They are great for when your machine embroidery leaves a small space between the outline and the fill work, skips a line of stitches, and if you have just the right color. I note that Nancy Zieman uses Sharpies on her landscape quilts, and I think they would probably work fine for the same purposes. I like the Artist Pens, though, because the tips are fine and their are a lot of colors, but I have a set of Sharpie colored markers. From Canterbury Knight…I inked both the boy and the birds you see here onto silk/cotton white Radiance (prepared for dye). Setacolor and Jacquard Lumiere fabric paints: I use these extensively when I quilt first and then paint. I lump them together because I use them together interchangeably. The Setacolor seem a little thinner than the Jacquard, which I like. I have found they are permanent once dry and heat set at least through one washing for both silk and cotton. The Setacolor Glitter finish I did not wash, but put on the quilts after they were blocked and heat set them. They add a lot of beauty for just the right thing. 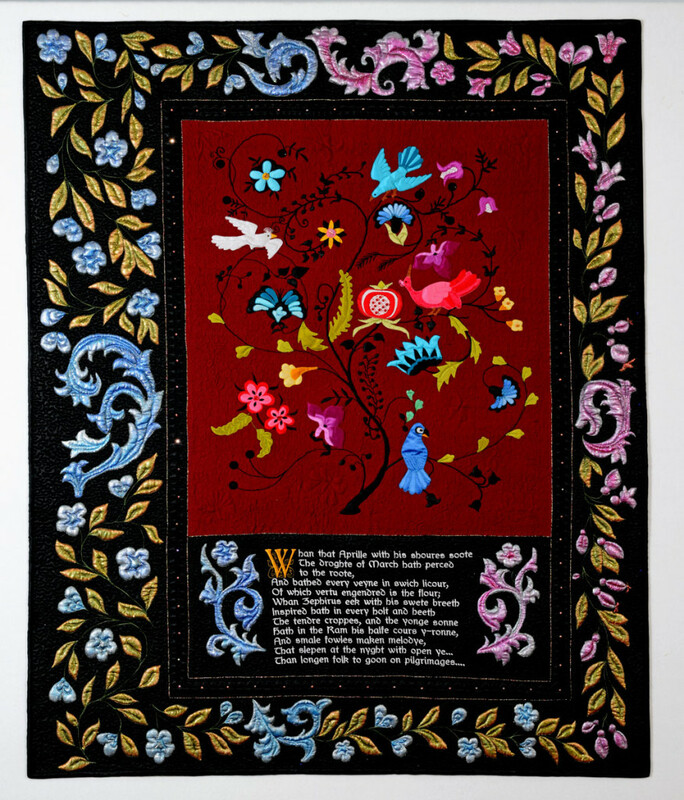 The border swirls and leaves were all painted after quilting using Setacolor and Jacquard paints, then glittered after blocking. Inktense Pencils: I tried using these a couple of times. For me, and perhaps I wasn’t using them right, they tended to change the hand of the fabric a little more than I liked, giving a slightly rough feel, but you can get a very crisp edge or blend them easily. I used an aloevera gel for the medium with them. I do know a lot of fabric artists use these with success. I did find a large number of tutorial videos on you tube, and here is one link showing painting on silk and another fairly complete video on using them and Shiva oil sticks too. Jacquard Procion MX Dyes: I just got some of these and haven’t tried them yet. I know that Hollis Chatelain uses these for most of her fabric painting. Sew happy everyone. A spot of paint on your quilts may be just the thing to accomplish a look you have not been able to achieve otherwise. A NOTE: Rather than shutting down comments like I said I would, I found a new security software for this blog and hope it will do the job. I still haven’t added back the subscribe to button, but might in the future.